A new loveteam is taking the the hearts of Filipinos by storm, and the on-screen couple did not even need dialogues. 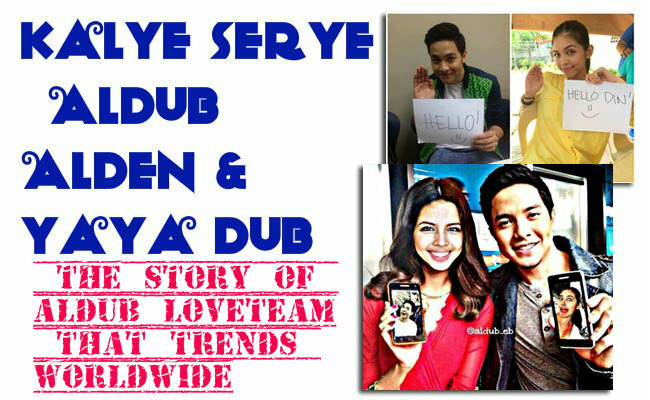 Aldub had been trending since they are introduced in GMA’s noontime show as part of the segment Juan for All, All For Juan. For the past two weeks, Eat Bulaga viewers had been following the love story of Alden Richards and "Yaya Dub." The two uses clips of songs to express their love to each other, however, Donya Nidora will do anything to stand in their way. Yaya Dub’s real name in Nicomaine De Capili Mendoza and raised in Sta. Maria Bulacan. She was known as the Dubsmash queen with her viral Dubsmash videos on Instagram personating various celebrities such as Kris Aquino. Her videos had gathered million views in just a few days. GMA Network took notice of Mendoza and made her a part of the noontime show Eat Bulaga. She did not have any dialogue, instead she uses famous lines in songs and facial expressions to express herself. Initially, her character is a snob selfie loving yaya taking care of Lola Nidora played by Wally Bayola. In an interview with Kapuso Mo Jessica Soho, Mendoza shared that she was not so confident at first. Unlike in Dubsmash that she can retake videos until it was done perfectly, her part in Eat Bulaga had to be live. She studies her lines before the shows starts. Mendoza considered her viral videos as an achievement, not knowing that it paved a way to another one. Mendoza graduated in Dela Salle College- St. Benilde with the course of Culinary Arts. She took up her On The Job training in New York. The 20 year old Dubsmash Queen admitted that she is used to making wacky faces. She used to secretly dream to be an actress, and she had no idea that it will come true. Now, Aldub had been gathering thousands of fans, looking forward to each episode of KalyeSerye. It may seem to be a live soap opera as described by Alden Richards in Startalk. Richards shared that he was also surprised on how the viewers took in their loveteam and promised that there is more to come in their story.